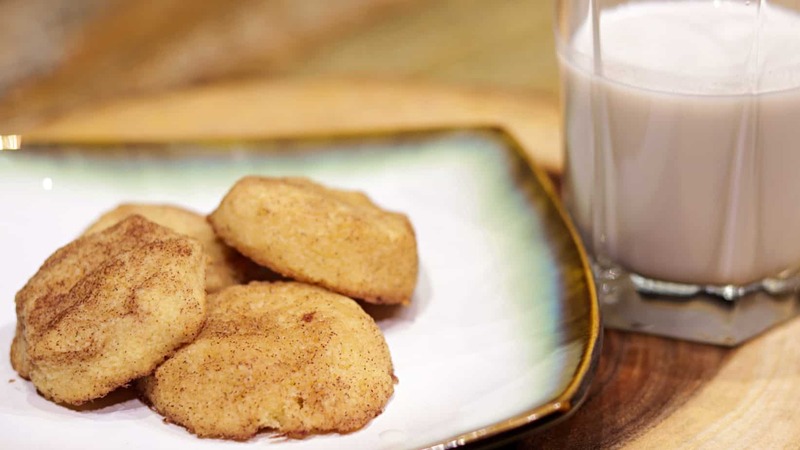 Do you think of Snickerdoodle Cookies as being a Holiday recipe, or are they more of an everyday flavor that you crave year round? 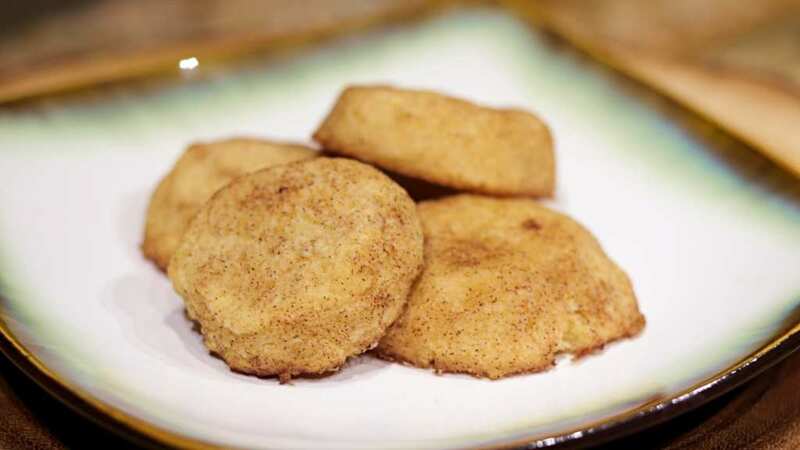 For me these Keto Snickerdoodle Cookies are just a delicious treat that is super easy to make, and they hardly take long to bake at all. Before you know it, in under half an hour you can have fresh-baked homemade cookies straight out of your oven. These are slightly buttery and pack just the right amount of that Cinnamon and Sugar flavor without the Net Carbs of traditional cookies. You can adjust my recipe to make more or less cookies if you would like to, but it may be a good idea to make these fresh more often than to plan to make them far in advance. They will freeze well, so you could always freeze the individual servings (4 Cookies each!) and then take them out and warm them up as needed. I tend to find that if I bake too many cookies at once I get too tempted to over-eat them, so I know myself well enough to cook them in small batches. I like to have a glass of Toasted Coconut flavored Coconut Almond Milk nearby when I have any Keto Cookies, as they are so good to dunk in there when I feel like it. The Coconut Almond Milk also gives me something slightly creamy to wash them down with too, which reminds me of good old fashioned cookies and milk. In a Large Mixing Bowl combine the Almond Flour, Lakanto Classic Monkfruit Sweetener, and the Pinch of Salt. In a Medium Mixing Bowl whisk together the Large Egg, 4 Tablespoons of Softened Grass-Fed Butter, and Vanilla Extract. Pour the wet ingredients from the Medium Mixing Bowl into the dry ingredients in the Large Mixing bowl and fold together with a spatula until the dough is evenly mixed. In a Small Mixing Bowl add the 2 Tablespoons of Lakanto Classic Monkfruit Sweetener and the 1/2 Teaspoon of the Cinnamon. Take a Large Cookie Sheet and cover it with Parchment Paper (this will not only prevent the cookies from sticking, but will also make cleanup so much easier later on. Spoon out the mixture into 12 evenly sized balls, these will be slightly smaller than a Ping Pong ball each. Roll these balls one by one in the Monkfruit and Cinnamon mixture, and form them into small disks by hand and place them on the cookie sheet at least 1 inch apart. The cookies will not flatten out too much when they bake, so if you want flatter cookies just be sure to smush them flatter. I caution against making them too flat, because you do not want them to fall apart after they are baked. 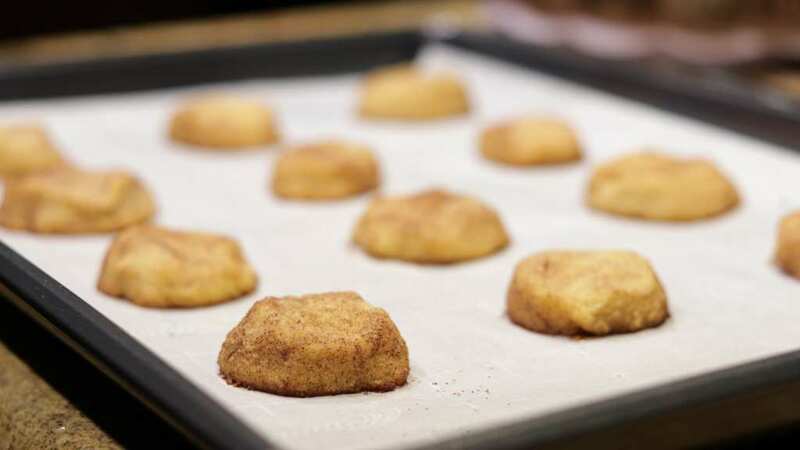 Bake the Snickerdoodle Cookies in the oven at 350F for approximately 10 minutes. This will vary based on ovens, altitude, and other factors so keep an eye on them. what can be substituted for the monkfruit? It’s not available and I would like to know what can be substituted in it’s place. Thank you! If you can find another sweetener with Erythritol in it, that will usually taste alright. I tend to stay away from the Stevia-based sweeteners though when baking since my personal tastebuds just seem to think Stevia tastes really bitter after baking. There is one Stevia blend that I do like called Pyure that I have bought at Walmart. IF you use Pyure just keep in mind that it is twice as sweet as sugar so you would use half as much in your measurements. Monk fruit sweetener is surprisingly readily available. Just ordered some from Amazon. Also available at Walmart. Ordered and received both regular and brown versions of sweetener. Be very careful if you have animals. Xylitol is poisonous to dogs. Yes, extremely poisonous. I don’t even buy it personally because I have two wonderful pugs that I couldn’t stand to see accidentally ingest it either. I have two pug babies too (they will be 13 in January!). I have kept xylitol out of the house because I want to keep my little crumb catchers safe as well. Love Lakanto and can’t wait to try your cookies! Will coconut flour work instead of almond? How would I adjust the amount? Thanks. Usually when you are substituting coconut flour for almond flour you will use about 1/3rd as much of coconut flour. It is very absorbent and soaks up a lot of moisture. I have not made these with coconut flour yet to confirm any adjustments to the other ingredients that may also be needed to get them the right consistency. I just made these and followed the recipe to the t and they came out SUPER wet. I cooked them 20 minutes and they still seem gooy. I don’t know what went wrong. I double checked the measurements and temp of my oven. Everything matched the recipe exact. I’m letting them cool to see if they will dry out more as they cool. Any advice or thoughts? Just curious – did the dough seem wet or gummy before you baked the cookies? If so, I’d hazard a guess you needed a bit more almond flour. But if the dough didn’t seem wet going into the oven, but came out wet and gooey, then I’m truly stumped. How did they end up turning out? In reply to the wet dough it “appears” in the video that more than one cup of almond flour was in the bowl, that looked like 2 cups of flour in that bowl was added but the recipe calls out for one cup. Please review and thank you for changing my life! I just pulled a batch of these out of the oven. Here are my some of my thoughts. The recipe measures were spot on and came to 12 of these little morsels exactly. However (and this is a biggie) the carb count is off. By a LOT. I have Type 1 diabetes and am on an insulin pump that requires me to enter in the total carbs sitting on my plate before I eat. 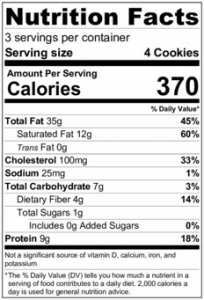 So when I hear that a cookie has only one gram of carbohydrate, I’m going to do the math. I got the nutritional information from the back of the monkfruit and almond flour packaging to determine how many carbs went into a single batch of cookies and then divided by 12. A single cookie contains 5 grams of total carbohydrate, NOT 1. Don’t get me wrong; 5 is a lot better than 25 for a regular store-bought cookie. But the difference between 1 and 5, for an insulin-dependent diabetic, is still a pretty big deal if we are not given the correct information. As for how they cooked up: when I pulled them out of the oven after 10 minutes they had collapsed and appeared to be liquifying. I gave them an additional 5 minutes and they appeared to set up after that, but there was some liquid separation of ingredients going on that I don’t understand. Maybe the butter? Use salted grass fed butter or unsalted? I I have these in the oven now. I just used salted butter and omitted the pinch of salt. Salted Butter. I rarely ever buy butter unsalted for my house. I don’t know what I did, but when I cooked mine they completely flatted out and turned into a crispy cookie rather than chewy. What did I do wrong? Did you use melted butter instead of just softened by chance? For me, mainly because of the sprinkled monkfruit on the outside there really isn’t a good substitute for it. Usually I will use Pyure brand as a substitute in many recipes, but since it is twice as sweet you wouldn’t be able to coat the cookies in it without them being overboard. Is it possible to substitute Swerve for the sweetener? And is the powdered version okay? Swerve will have a different amount of bitterness compared to the monkfruit, and the powdered version tends to be even more so. I put this exact recipe in my carb manager and it says 6carbs per cookie.. what did I do wrong? I don’t think that Carb Manager has been accurately calculating the real carbs from Monkfruit and Erythritol. Add a little bit of salt to it to make up for the taste. Shouldn’t need much. I made these for quick and easy treats for the week and I was blown away of how amazing they are! I accidentally used powdered monk fruit instead of the classic for the outside and it created a little bit of a caramelized crunchy layer. which was even better. I only have the individual stevia packets and the powdery stevia sugar for sugar replacement for baking. How much of that would I use in replacement of the monk fruit? I made these snickerdoodles today and they are the best low-carb cookies I have made! I did add 1/2t baking soda and 1/2t apple pie spice to the dry ingredients, and rolled in monkfruit and apple pie spice (I love the combination rather than just cinnamon). All of the sweetners upset my tummy? I made cookies with Erythritol sweetener, and stomach pains? If it’s not sugar I can’t use it? Any other ideas?